Greetings from New Mexico! Gary and I arrived on Friday and have spent the last two days at the Mesalands Dinosaur Museum researching on some previous finds associated with the dig site we will be working on for the next five days. I also saw plenty of cool desert wildlife including a whiptail lizard that I miserably failed to catch...more on that later. Lets take a look at a prehistoric southwestern animal featured as a skeletal mount at the Mesalands Dinosaur Museum! Desmatosuchus haploceras was a truly interesting animal. At first glance most would think it is some sort of a dinosaur related to Ankylosaurus or Stegosaurus. It certainly has a lot in common with them, check out that armor! Despite this, Desmatosuchus and other animals in its order, the Aetosaurs, was not a dinosaur at all but a different kind of reptile that belongs to the same group as crocodiles! In fact, its genus name translates to "Link Crocodile". Desmatosuchus lived in what is now the Southwestern United States during the Triassic Period about 230 million years ago. When alive it would have coexisted with its relative, Postosuchus, and the early dinosaur, Coelophysis. Lets take a look at this animal piece by piece. The head alone is really unique. It had small, weak teath so it most likely was a plant eater but I wouldn't be surprised if it exploited other food sources like insects or carrion as well. Its snout is upturned at the end sort of like a pig's snout so Desmatosuchus probably was adapted for uprooting food underground using its face like a shovel and possibly utilizing its strong forearms armed with long claws to dig. Bronze skeletal mount of Desmatosuchus on display at the Mesalands Dinosaur Museum in New Mexico...and some guy from Jersey. Desmatosuchus was equipped with bony armor plates covering its back and had long, curved spikes growing out of the tops of its shoulders, most likely to repel potential predators like Postocuchus. It is because of the armor that many people mistake Aetosaurs like Desmatosuchus for Thyrophoran dinosaurs like ankylosaurs. This is a perfect example of convergent evolution, where two unrelated animals that may even be separated by millions of years of time, have similar adaptations. In this case it started with Aetosaurs, popped up again with dinosaurs and then happened a third time with mammals, the armadillos! Check out that upturned snout! As always feel free to comment below or on our facebook page. For the next week it will be a bit difficult for us to post as we will be in the field most of the day and probably passed out from exhaustion the rest of the day but we will do the best we can! Stay tuned! Parker, W.G. (2005). 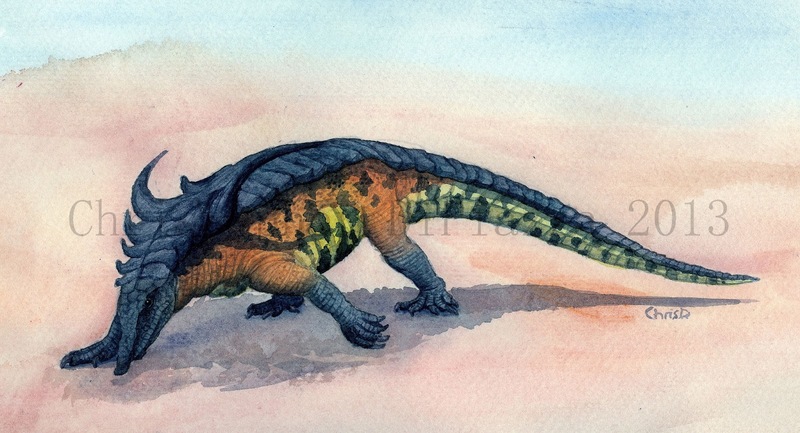 A new species of the Late Triassic aetosaur Desmatosuchus (Archosauria:Pseudosuchia). Compte Rendus Palevol 4(4): 327-340. Parker, W.G. (2008). Description of new material of the aetosaur Desmatosuchus spurensis (Archosauria: Suchia) from the Chinle Formation of Arizona and a revision of the genus Desmatosuchus. PaleoBios 28(1): 1-40. Parker, W.G. (2007). Reassessment of the aetosaur “Desmatosuchus” chamaensis with a reanalysis of the phylogeny of the Aetosauria (Archosauria: Pseudosuchia). Journal of Systematic Palaeontology 5(1): 41-68. Great reconstruction. I love the colors!